Jake Epping 35 teaches high school English in Lisbon Falls, Maine. On his deathbed, pal Al divulges a secret portal to 1958 in his diner back pantry, and enlists Jake to prevent the 11/22/1963 Dallas assassination of American President John F. Kennedy. Will Jake lurk in impoverished immigrant slums beside troubled loner Lee Harvey Oswald, or share small-town friendliness with beautiful high school librarian Sadie Dunhill, the love of his life? I wasn't sure what to expect in this story. Having little to no knowledge of the JFK assassination, I was dubious over what this novel could do for me. I hadn't thought, however, about the supernatural, historical, and philosophical questions the fabric of plot would bring to the surface. King is known for his horror writing, but this isn't a horror novel. It's a psychological, philosophical suspense novel, with a sprinkling of romance. King really isn't known for his romantic writing, but he does well here. The love he portrays is honest and whole, and had me in tears in places. The writing in the novel overall is natural, the characters are memorable, and each one, however minor, is incredibly relevant to the plot. With minor knowledge of the assassination, it's easy to imagine Oswald as a mastermind villain, whose only aim in life was to kill the president. King portrays him, however, as a little man with a lot of issues, who stumbles into this history-changing event by accident. We see his brutality, but also his tenderness and naivete; this was a shock, but I think it added a much needed layer to the story. The past is almost personified here, with its own doings, and its attempts to throw obstacles in Jake's way whenever he attempts to change it. The bigger the change, the bigger the obstacle. The past is obdurate, after all. It doesn't want to be changed. The research King has carried out for this novel is clear and astounding; I really felt as though I was being transported back into the sixties, and I loved every minute of it. I liked how quaint it was; how everyone smoked without worrying about cancer, and ate without worrying about cholesterol. There's a real feel of innocence; boys and girls learning how to lindyhop, small town communities pulling together, and The Catcher in the Rye still a banned book. The biggest horror King writes into the novel is the notion that the smallest of actions can have a massive effect on our lives. He mentions the butterfly effect a few times, too. We see Jake crucify himself each time one of his actions has a disastrous effect, and we mourn with him. 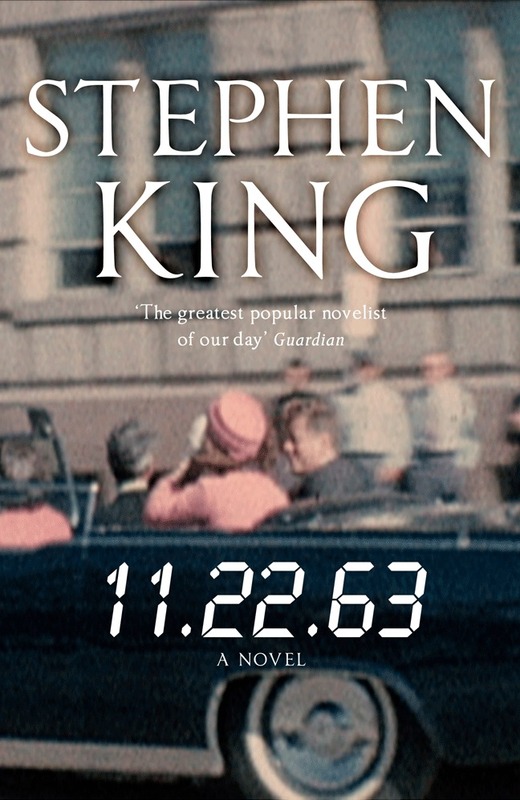 We're reminded of the things that could have been prevented had Kennedy lived, but the world King shows us towards the end of the novel is absolutely abominable. This poses interesting questions on fate, and for me, karma. 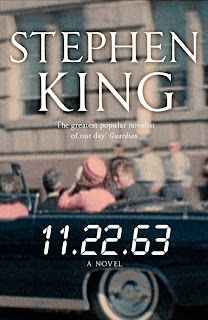 11.22.63 is a wonderful novel, and I'm really impressed by King stepping outside of his usual genre. I'd recommend this to my historian and philosopher friends, but mostly to those of you who just love a great story. "If there is love, smallpox scars are as pretty as dimples."